It was a frigid Saturday in New York when seven chefs gathered in the back room at Jimmy’s No. 43 to unveil their steaming pots of the French countryside comfort food, cassoulet. A fluid stream of Greenmarket supporters sampled each one throughout the afternoon until pretty much every bean was scooped up. Asked to vote for their favorite takes, each taster turned their attentions to printed sheets describing the cassoulets, their creators and affiliations. Among them were local and seasonal culinary expert Kelly Geary of Sweet Deliverance, former Greenmarket Manager and chef-to-be Melissa Rebholz, Jimmy No 43’s own chef John Crabbs, Italian chef and traveling pizza teacher Mark Bello, Rockaway Beach surf taco shop extraordinaire Andrew Field, and former Pegu Club and wd-50 (whoa!) chef Phillip Kirschen Clark. Then some blogger and cook-off fanatic of Not Eating Out in New York. Chef Mark Bello, of Pizza A Casa NYC! 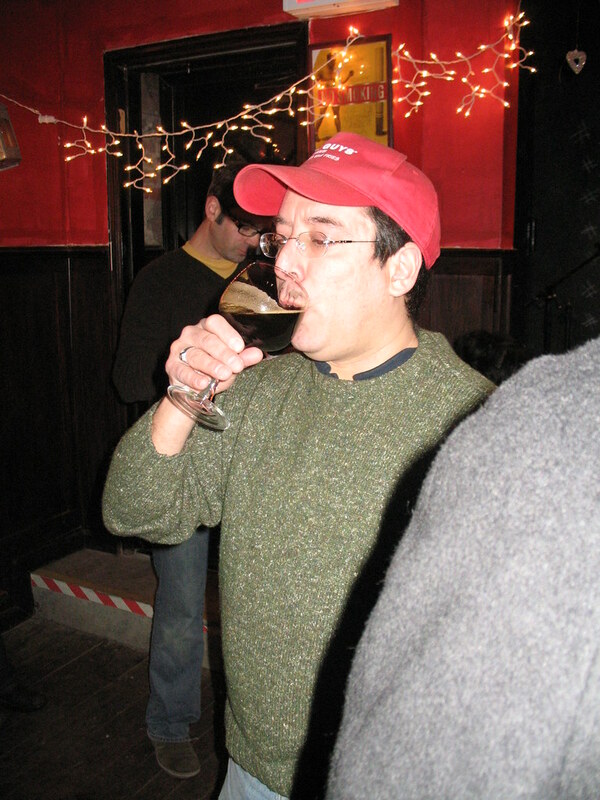 Food writer Joe DiStefano, pairing the plat du jour with one of the rotating craft beer menu’s heady stouts, it seems. And famous actor Umit Celebi (right), seen here with the gracious host Jimmy Carbone (left). 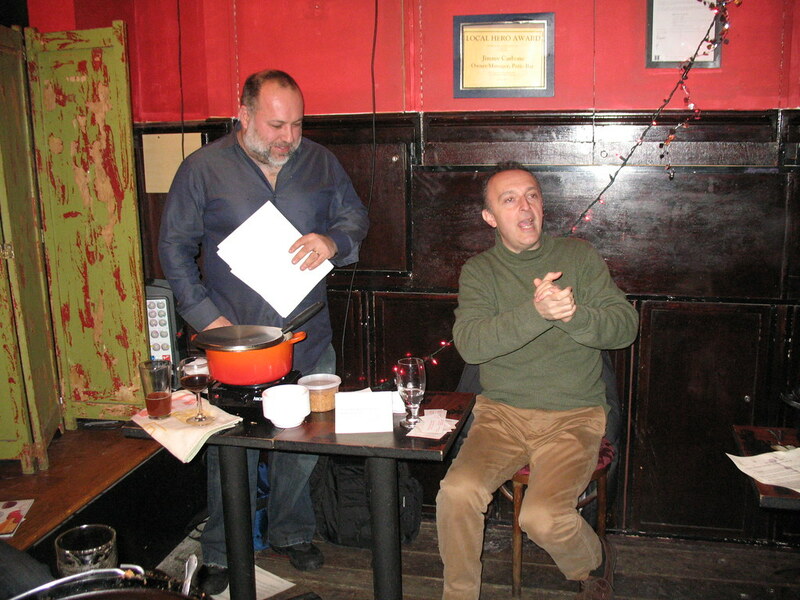 The award for this cook-off was mostly decided by the audience votes, with the guest judges offering their sanction on the winner. It was a unanimous decision between the two judging factions to place Mark’s cassoulet at the top, though, we were told. Once again, I struck out on cook-off glory, but not without having a fabulous time, and more than my share of this unique, hearty dish. I don’t know when I’ll ever have the chance to eat seven types of cassoulets in one day again — not that this doesn’t sound like a great, rainy day idea. At least I can look forward to plenty more events at Jimmy’s No. 43 to benefit or simply fashion a great meal around sustainable, local, seasonal and artisanal eats to come, whether cassoulet or Greenmarket-inspired. 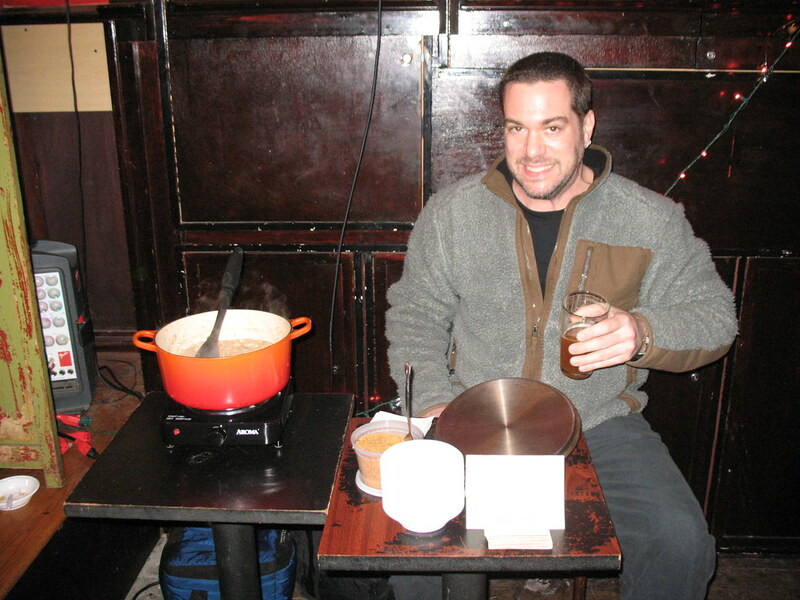 As tasty as the winning version was, I thought all of the cassoulets in competition were pretty outstanding. I’m going to conclude that it’d be really hard to make a slow-cooked bean casserole flavored with generous portions of smoked and fatty meats not hit the spot on a cold winter day. As I tasted around the room I found myself going back for seconds of Melissa’s and Kelly’s cassoulets in particular, which both had fresh herbs and in Melissa’s case, a bit of greens in the mix. 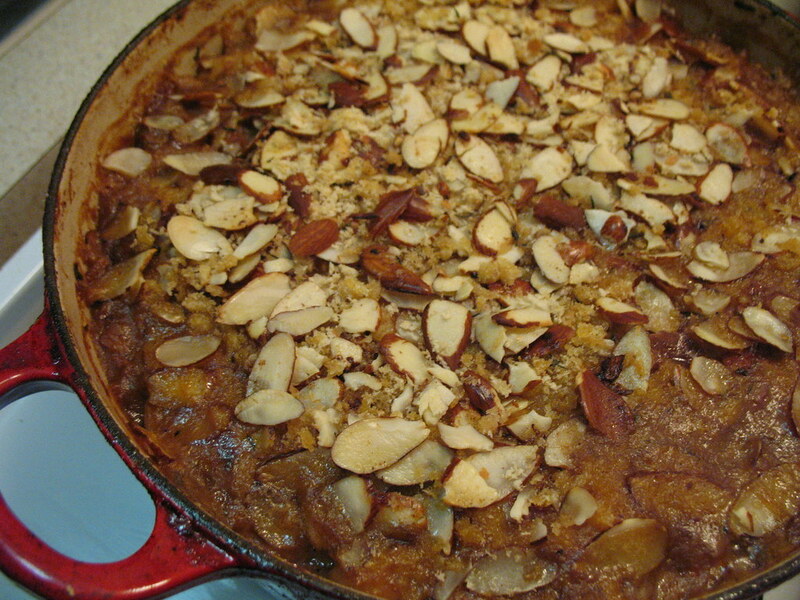 I was also pleased with the outcome of my cassoulet: an apple cider and smoky ham hock-steeped, maple sausage and pork shoulder-studded, almond and breadcrumb-topped first-time try. So I’ve got that recipe posted below. However, Mark’s winning version remains shrouded in delicious mystery. The lingering suspense! Best to check out one of his cooking workshops to try to sneak the secret recipe. Heat a very large Dutch oven or oven-safe casserole (or cassoulet) with olive oil over medium-high. Brown the sausages on all sides, about 4 minutes. Remove from pot and set aside. Season the pork shoulder pieces with salt and pepper in the same pan. Brown on all sides, about 6 minutes. Remove from pot and set aside. Add the bacon, onions, carrot and celery and cook, stirring, about 8 minutes until vegetables are softened. Add the tomatoes and garlic and cook another 2 minutes, stirring occasionally. Add the sherry and cook, stirring, until the liquid has reduced by one half. Strain the beans and add to them to the pot along with the ham hock, pork shoulder, apple cider, applesauce, and the bay leaves and all but 2-3 sprigs of thyme wrapped together with twine. Bring to a boil. Reduce heat to low and simmer, covered, for about 1 hour. Remove the ham hock and pork shoulder pieces. Remove bouquet garni (of bay leaves and thyme) and discard. Once cool enough to handle, pull meat from ham hock and shred the pork shoulder with hands to about 1/2-inch pieces, discarding any bones. Slice the reserved sausages to 1/2-inch pieces. Add all the meat to the pot, and stir to combine thoroughly. Add salt and pepper to taste (at least two teaspoons of salt). If mixture looks too thick, add a little more of the applesauce or apple cider. 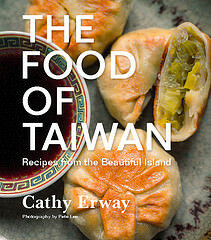 While tasting and stirring, preheat oven to 300 degrees. Combine the breadcrumbs, almonds, and reserved thyme leaves (removing any bits of stem) in a bowl. Sprinkle on top of cassoulet. Bake, uncovered for 1 hour until breadcrumbs are lightly browned on top. Let cool for 15 minutes before serving. Nine brownie points: The bad news about cassoulet is that while it retains the relatively healthy appearance (chunks of meat casually blend in with all the flavorful sauces) of a bean-based dish, the real strength of the dish comes from all that fatty pork. Traditionally, all the browning would have been done with huge glunks of duck fat, too, which many of the cook-off contestants gamely got into. Still, sausages, bacon, fatty pork shoulder and ham hock will add plenty of cholesterol as well as that round, rich flavor. To cut it, I cooked it in apple cider instead of, perhaps, pork stock, and this gave the flavor a little acidity and a dose of Vitamin C — plus, it’s known to help balance out the “bad cholesterol,” much needed in this case. Seven maple leaves: The meaty hunks of pork are the star attribute here, and there’s plenty of it to go around in this recipe. I can’t say enough good about the quality and flavor of the pork products at Tamarack Hollow Farms. 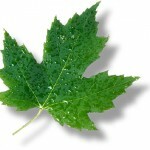 (In case you’re wondering why all the maple seasoning, it’s because the farm is located in Vermont.) Then, I didn’t really now what I was planning to make when I went to the Greenmarket to buy them, and after deciding I needed more protein, I made a trip to a local meat market in my neighborhood for the bacon and pork shoulder, which I’m sure didn’t come from pasture-raised pigs. I chose apple cider for this dish as much for its fruity flavor as its seasonality; it was going to be either that or squash. You managed to get my good side in that shot! Your cassoulet was applicious! Still kinda steamed I didn’t get to taste Bello’s. It sounds great. I really enjoyed yours. They were all delicious and none were what I expected. Very interesting interpretations. Great event! Thanks to the chefs and especially to Jimmy (he’s got a new ardent fan)! 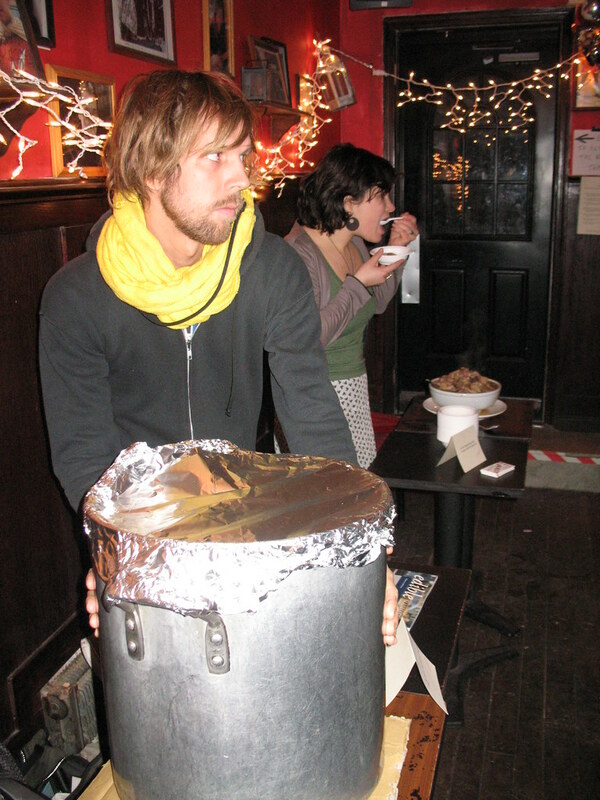 Not Eating Out in New York » New Amsterdam Market benefit chowder cook-off is tomorrow! If you want to see a Cassoulet competition goes to Toulouse and goes for the Lucien Vanel contest. You will found what we call a Cassoulet in France and not a bean stew. Please keep the tradition and try not to reinvent Dishes like this. You should invent name for your dishes that will be better. I was going to make the Veggie Cassoulet, but I couldn’t find Crimini Mushrooms (and don’t eat enough mushrooms to know which to substitute) and then guessing that my veggie dinner companion was going to bail on dinner, made this one instead. Yum! cathy, amazing , im planning the 10th annual cassoulet cook off for januay 20, 2018….love that you captured so many memories of these events.